Virgo inter Virgines (The Virgin Mary among the other holy virgins) by the anonymous Netherlandish painter known as the Master of the St Lucy Legend, ca. 1490. (Click to enlarge.) - Furthest on the left, St Apollonia dressed in white, holds a tooth with a pair of pincers; she had all of her teeth knocked out in her martyrdom, and is the patron Saint of dentists. St Ursula, in a black and gold robe, reads a book; an arrow, the instrument of her martyrdom, is under the folds of her skirt St Lucy, in green, holds a golden plate with two eyes on it. St Dorothy, at the rear in brown and blue, holds a crown and bell. St Catherine receives a ring from the baby Jesus; her red cloak is covered with her symbol, the wheel. St Mary Magdalene, kneeling, wears white over read, and presents to Him a golden pot of ointment; the myrrh for the anointing of His body. St Barbara holds baby Jesus’ other hand; her black cloak is covered with her symbol, the tower. 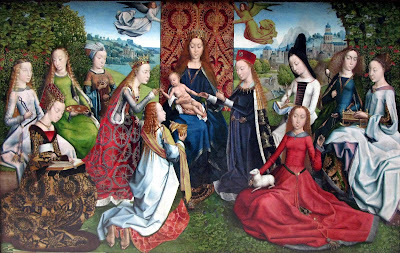 St Agnes, in red and sitting on the ground, holds a lamb, and in her other hand a ring. St Margaret, in a black hat, holds a cross and a book; in the background, St George slays a dragon, as Margaret also did. St Agatha in blue holds a pincers with a breast, a reference to her martyrdom. St Cunera, patron of the Rhenen area near Utrecht, holds a cradle and an arrow; she was said be one of the 11,000 companions of St Ursula.